In which G.M. 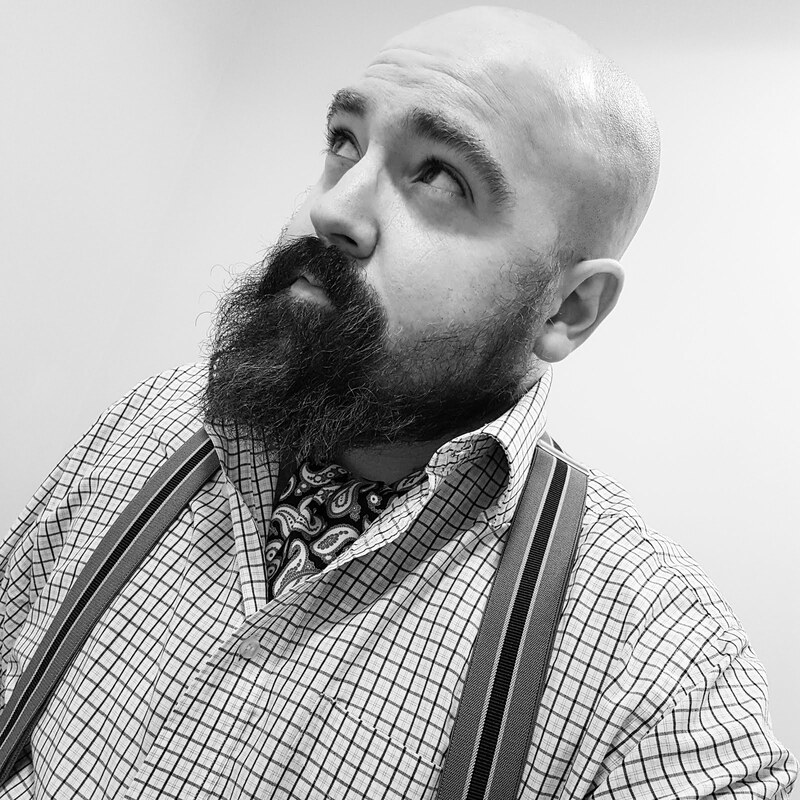 Norton feels ready to take on the world. I recently managed to purloin a vintage Smiths Deluxe watch. Made in England at their Cheltenham factory, Smiths watches have a truly fascinating history. 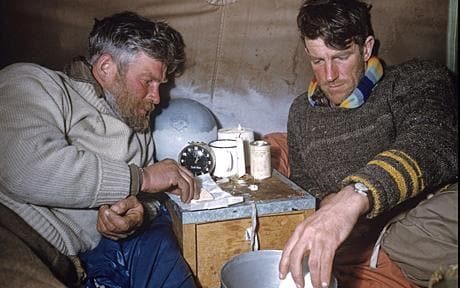 Edmund Hillary wore a Smiths Deluxe (the A404) when he climbed Mount Everest in 1953. And when Vivian Fuchs and Edmund Hillary successfully led the Trans-Antarctic Expedition across Antarctica in 1958, the entire team also had Smiths Deluxe watches strapped to their wrists (the A454). My vintage Smiths watch is the A460, which replaced the A454 (although they are identical in every way, except that the A460 is shock-proofed). 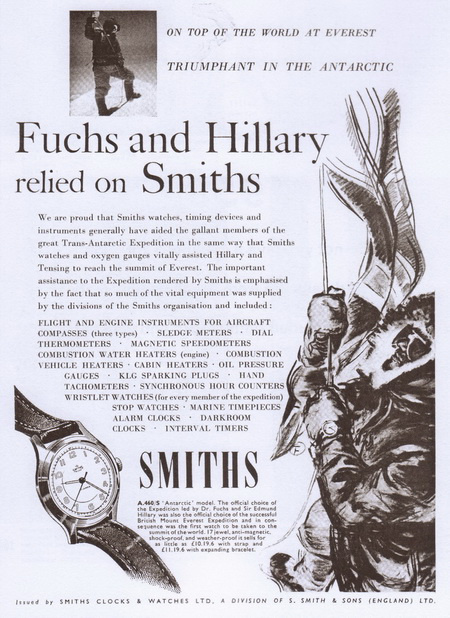 "The official choice of the Expedition led by Dr. Fuchs and Sir Edmund Hillary was also the official choice of the successful British Mount Everest Expedition and in consequence was the first watch to be taken to the summit of the world. 17 jewel, anti-magnetic, shock-proof, and weather-proof it sells for as little as £10.19.6 with strap and £11.19.6 with expanding bracelet." I love that my watch can be mentioned in the same breath as legendary explorers and their tales of derring-do. Especially when they also wear such glorious jumpers too. If you're keen to get yourself a vintage watch, you could do a lot worse than a Smiths Deluxe. They're very handsome; made entirely in England; and despite prices rapidly increasing, there are still bargains to be had. 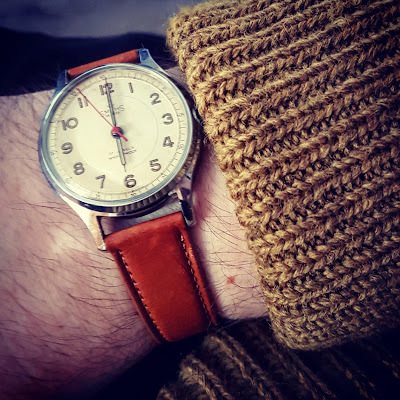 With one of these mid-century beauties on your wrist, you'll be transported back to a time where Queen Elizabeth's shift as monarch has only just begun, Edmund Hillary has reached the highest point on Earth and perhaps a nice English motorcar is looking resplendent on your driveway. What's more, you'll only have a few years to wait until the England football team win the World Cup. Marvellous. Thank you! I scoured eBay for quite a while, but it was worth the effort. Smiths also had an Empire range, made in Wales. The Empire watches were their budget range but they're still ticking and there are some lovely styles. I shall keep an eye out for those! They'd make a lovely Christmas gift. Nice watch. "Edmund Hillary wore a Smiths Deluxe (the A404) when he climbed Mount Everest in 1953" er, not quite. He wore a pre-production model (no catalogue ref.) and was gifted an A409 afterwards. You can see Hillary's actual watch worn on the Hunt expedition to Everest in the Science Museum. It had special low temperature lubricants. Cheers!